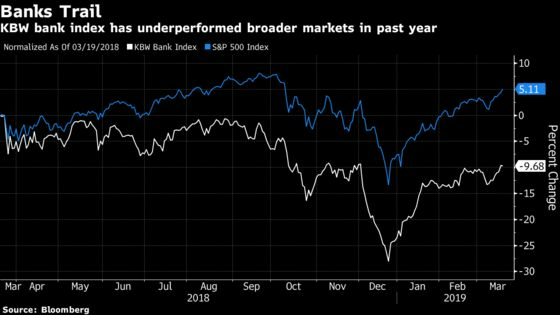 (Bloomberg) -- Shares of big banks were extending multi-day winning streaks ahead of Wednesday’s wild-card-loaded Federal Reserve meeting, with JPMorgan Chase & Co., Citigroup Inc. and Wells Fargo & Co. rising on Tuesday to the highest levels since early December. At the same time, the broad KBW Bank Index erased its morning gains in mid-day trading. A decline would break Monday’s seven-day winning streak, the longest since October 2016. The index might still have room to run, as it’s down 9.7 percent in the past year, while the S&P 500 has gained 5 percent. A Fed that stays patient, while Chairman Jerome Powell voices bullish thoughts on the U.S. economy, as he did during an interview earlier this month with "60 Minutes," might be a good outcome for bank stocks. Last year, analysts were concerned higher rates, initially good news for bank earnings, were tipping into a problem, as banks were forced to pay more for deposits. Fears about whether financial stocks can keep rallying despite lower rates might also be soothed by an observation made by Nomura Instinet technical analyst Frank Cappelleri. In a note, Cappelleri pointed out that financials sputtering while rates rose had been“the bane” of the market’s existence last year, while lower rates along with higher financial stocks were in place during the "zero interest rate policy" period from December of 2008 through the end of 2015. Looking ahead, super-regional banks are likely to report “decent” first-quarter earnings, Macquarie’s David Konrad wrote in a note, due to a rate hike and strong end-of-period loan growth in 2018’s last quarter. That’s even with headwinds from deposits, he said. Konrad’s top idea for the first quarter is PNC Financial Services Group; he’s more cautious on Comerica Inc., Regions Financial Corp. and BB&T Corp./SunTrust Banks Inc.
Read more: Regional Banks Rally With Eyes on Fed, Roubini Flagging U.S.